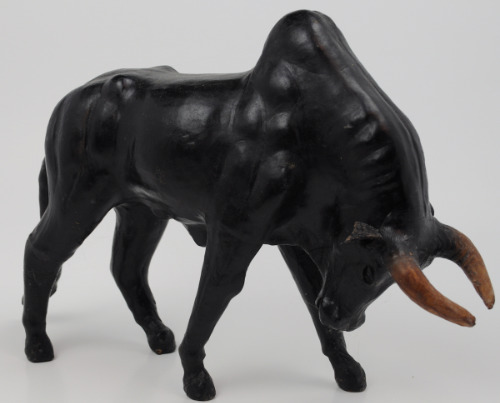 From our leather animal figure collection is this vintage leather sculpted horned black bull. The colors are nice and vivid with the leather in very good condition. Lots of attention to facial and horn details. It has leather flexible ears and glass eyes. We have several animals in this collection so visit our other leather animal listings too! IMPORTANT FREE SHIPPING NOTE: This animal will ship very carefully packed and USPS Priority Mail for safe and faster delivery absolutely free to your doorstep!